It’s the nature of puppies to get dirty and need a puppy bath so make plans now to learn how to bathe a puppy. While some breeds need more bathing than others, excessive baths can strip natural oils from the coat and dry the skin. Unless they get quite grubby, have a close encounter with a skunk, or are dog show prospects that need frequent grooming, most puppies shouldn't need a bath more than one to four times a year. 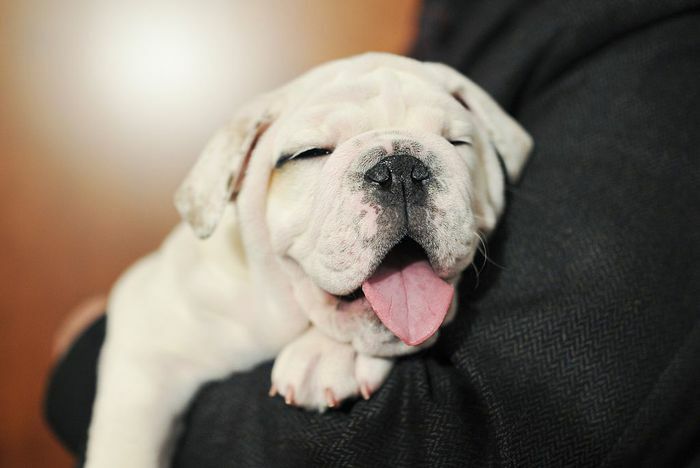 Puppies shouldn't be bathed until they are at least four weeks old—six or eight weeks is better. The little guys have trouble regulating their body temperature at that age and can become chilled. 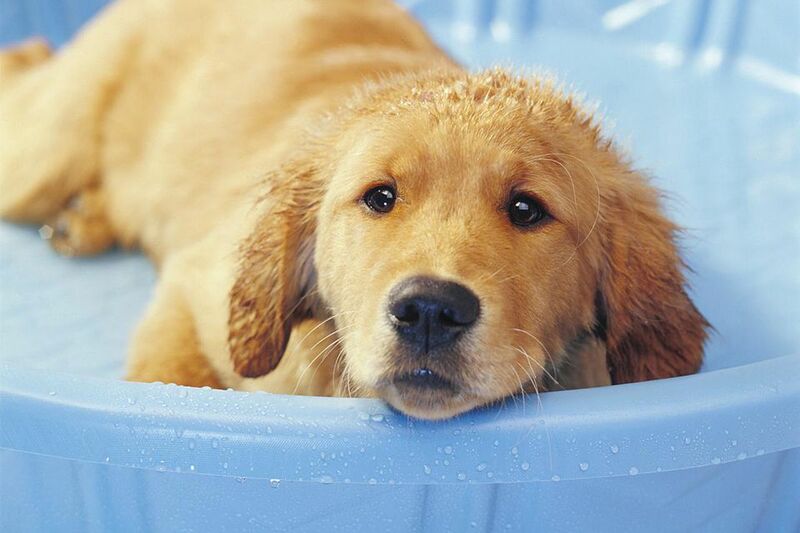 Puppies who get sick with diarrhea may need a dunking, but the stress of a bath can make the illness worse. They could even end up with pneumonia. Poodle-type coats require the most bath time. Plan on bathing your curly coated pups at the same time they get the coat trimmed, trim about every two months. Silky and wiry coats do well with four baths a year. Double-coated breeds like German Shepherds need a bath a couple of times a year. Aim for spring and fall after their normal shed. Smooth coated pets like Rottweilers may need a bath only once a year. Of course, if they get smelly or dingy between times—Dachshunds tend to get a wee bit pungent—additional baths may be needed. With smooth coats, though, often a damp washcloth or dry bath product can take care of the between times. Be sure there are no mats by thoroughly combing and brushing your puppy before you hit him with water. Moisture cements mats into solid masses impossible to remove without electric clippers. Assemble all the supplies you need beforehand. Puppies object to baths when they're frightened, so prepare ahead of time out of his sight. That includes puppy shampoo, cotton balls, mineral oil, ​washcloth, old clothes—for you to wear because you will get wet!—and at least twice as many towels as you think you’ll need. Use only shampoos approved for puppies. People products–and especially human baby shampoo—is designed for oily scalp and can dry out your puppy’s tender skin and possibly cause allergic reactions. Bathe large to medium pups in the bathtub. If the day is warm, the garden hose in the backyard or patio may be appropriate. A waist-high sink works well for small dogs and is easier on your knees. For little pups, you can use a series of buckets or even clean wastebaskets filled with water and ‘dunk’ the baby to soak his fur, sud him up thoroughly, and then rinse. Place everything near your sink, tub, or patio within easy reach. When bathing indoors, the area should be warm and draft-free. Be sure to push shower curtains and any breakables out of the way that could spook your puppy. If you're container-bathing, fill the tub, sink or bucket with dog-temperature water (about 102 degrees) before you bring in the victim—er, your pet. Making him watch isn't nice. It's easier to bathe your dog when two hands are free. Bath tethers are available that have a suction cup that secures one end to the tub or sink while the other clips to the puppy’s harness. When bathing outdoors, tether the puppy with a short lead to a fixed object. Before beginning, place cotton in the pet's ears to keep out the water. A drop of mineral oil or artificial tears in each eye helps protect them from errant suds. Place the dog in the standing water. It doesn't need to cover him; level with his knees is fine and lets him feel he can stand above it without risk of drowning. Use a plastic cup or ladle to dip water over the pup, or use a hand-held sprayer. Many pups get scared by sprayed water, so use only a low force and keep it against the coat to soak the fur. Don't spray or dunk the puppy's face; that is very scary. Instead, use a washcloth to clean and rinse the face. Once the fur is wet, apply a thin stream of pet shampoo along the back—or lather the shampoo in your own hands and then apply—and suds your pup thoroughly, then rinse. If you're using a flea product, suds the pup's neck first to create a flea barrier the bugs won't cross. Most shampoos, especially flea products, work best if left on for ten to fifteen minutes. The most critical part of bathing your puppy is the rinse cycle. Leaving soap in the coat can cause an allergic reaction, can attract dirt and makes the fur look dull and dingy. So after you've thoroughly rinsed the pup, do it once more before calling it quits. Then allow your pup to do what he's been yearning for the whole time—shake off the water. If his shaking doesn't fling out the cotton, you remove it from his ears. Leaving the cotton in can cause an ear infection. Smooth coated dogs air dry very quickly. Dogs with more fur require lots of towels. As much as dogs may dislike the bath, they often relish the toweling off afterward. It’s a chance to steal the towel, and play puppy games of tug or keep away. The more you can make the bathing experience fun, the less your dog will dread the experience. Some pups tolerate a blow-dryer on a low setting, which will help fluff up the fur. Be sure the dog is dry to the skin before allowing him outside if it's a cold day. Bathing your puppy will be much easier with some familiarity with handling and gentle restraint!